Druing the bon holidays, elder girls constructed a stove (kamado 竈) outside and prepared some simple rice dishes for the younger girls. The elder ones, 14 and older, would do the cooking while the younger ones would chase away the nosy young boys. The girls of exactly 14 years of age (being now available for marriage) did not use any underwear (koshimaki) on that day, so it was a kind of "Coming of age" ceremony. After the festival they got their own waist belt (koshimaki) and were considered a woman. The girls cooked rice with red beans, lily roots or mixed vegetables. 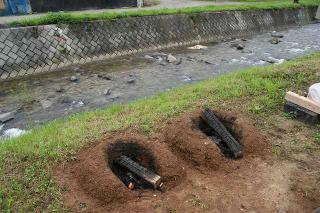 In some areas, the stove and a little hut were built at a crossroads, where the children would later eat (tsujimeshi). Souls of people who had died without anyone coming to get them for this o-bon festival could be lingering at the crossroads and were invited to participate in the meal. Since children were considered close to the deities, the hungry ghosts did not harm them. The young girls connected this world 此岸 with the next 彼岸 world of the gods.